Like I said in the top 4 Best Pine Tar & Baseball Rosin post, the true test of pine tar quality is when the weather is very cold or very hot. My first experience with Pelican Bat Wax really surprised me. It was 38 degrees outside, which is usually when most pine tar sticks let you down. The Pelican Bat Wax pine tar performed perfectly. 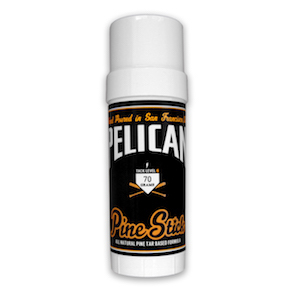 My favorite pine tar from this company so far is the Pelican Pine Stick. It’s packaging is different from most pine tar sticks, and I really like how much easier it is to apply to the bat handle. Convenience – The very first thing I noticed is it looks like a giant tube of chapstick. The bottom twists to push up the pine tar, which makes application super easy. The cap screws on to keep it clean. This is awesome, because it stinks when your pine tar stick has been sitting in your bag and gets debris all stuck to it. I’ve never seen pine tar with this packaging but I loved it. 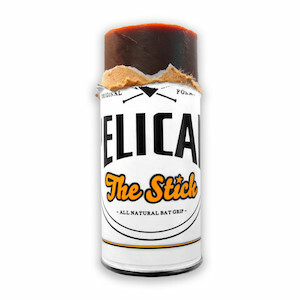 Performance – This product is 100% natural pine tar (their other pine tar stick is a blend). The tack level for the Pine stick was 6, but it was plenty tacky and had an all around great feel. The best thing about it was I applied the tar to my bat in a 38 degree weather day. The cold usually makes for a slippery grip or even feel like there was no tar applied at all. 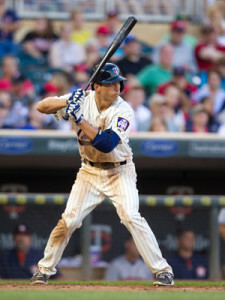 The “Pine Stick” felt the same on my bat in 38 degrees as it did in a 65 degree batting cage. This is when I knew I was dealing with a great product. Another indicator of great performance is that I haven’t need to use rosin with this pine tar yet (the weather has been on the cooler side). Normally, when your bat grip gets a little slick with pine tar alone, it’s necessary to use rosin to get it tacky again. My only reservation is that I haven’t tried this one in extreme heat yet, so I will have to update this review once I get the opportunity. 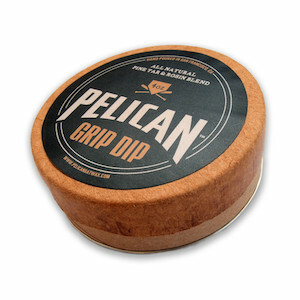 I suspect that the Pelican products will be similar to other high-quality pine tar sticks in that you’ll need to apply some rosin to your bat grip once the weather heats up. This one, the Pelican Pine Stick, was my personal favorite. While the traditional stick is also great (see review below), the Pine Stick was my favorite because of the applicator. It had the extra convenience factor without sacrificing performance. This had a tack level 7 and had the more normal cardboard tube packaging. I noticed a very small increase in tack from this product from the tack level 6. It was very much in the range of good stickiness. It handled perfectly in the cold and the website says that “The Stick” is a new formula that has increased durability in warmer temperatures (and also is easier to apply). Since I haven’t been able to use it in 100 degree weather I haven’t seen it perform for myself, but from what I have seen so far, this is a homerun. The Stick is a great product. I would have 100% confidence using during a Major League game. I liked #1 the “Pine Stick” the best because of the packaging. Both had A+ performance, but Pine Stick twist bottom made it super easy to apply to the bat. Review for the Pelican Grip Dip and the Glove Rub. Stay tuned, because I’m pretty excited about these new ones, especially finding something to replace using Lexol on my glove. We’ll see how it goes! Pelican Bat Wax is a small company based out of San Francisco. I think their products are so good because they are small company just focused on a few products. Everything is hand-poured and uses only all-natural ingredients. I plan on trying more products from Pelican Bat Wax but for now the two products I have tried the “Pine Stick” and “The Stick” were great. This is what I will use for the rest of the off season and right into the upcoming baseball season. Also, once I get into hot weather I will try “The Stick” and see how it stacks up. Since the website says that it handles well in heat, I will try it, and compare it to some others that I know basically melt in the heat. When I find a product I like and works well, I stick with it. Pelican Bat Wax pine tar is that product for me and I highly recommend it. Thank you in advance for clicking our links. It’s with honest product reviews like these that we support the 100’s of pages of free baseball instruction on this website, and it’s totally free for you. So if you happen to find what you’re looking for and make a purchase after clicking one of the links below, we want to say a sincere THANK YOU from Doug, Sarah, and the entire PBI community.